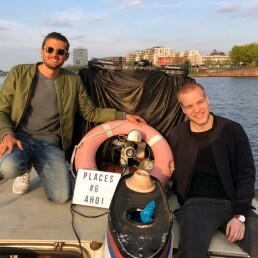 is an unique live stream concept developed by the DJ and producer Philipp Wolf and the world traveller Marko Roth. With extraordinary locations and the impulsive sound of Philipp Wolf, PLACES has already reached more than five million viewers. Placing Philipp Wolf in a complete unusual environment for a DJ set, is the common theme of all the different episodes. Some of them have taken place at a helicopter flight, a busy airport runway, a freezing ice rink or a cozy little barbershop just to name a few. The DJ live set is broadcasted on social media and implemented in cooperation with several other partners. Be ready for a musical journey around the globe and discover so much more unique places with Philipp and Marko.